Editor's note: On Monday, we announced four new ways to help teachers engage their classes using Google tools. In this post, we’ll dive deeper into one of these tools: Quizzes in Google Forms . If you are at ISTE in Denver, visit us at booth #2511 in the expo hall to learn more and demo our new tools. Educators have told us that collecting feedback earlier in the learning process results in better outcomes for both teachers and students. But they’ve also shared that creating assessments and providing feedback can lead to hours of repetitive grading. Dr. Ismael Piedra, a professor at the Instituto Technologico de Monterrey, for example, used “exit tickets” after his lectures to check student comprehension. But his attempts at gathering quick feedback would often result in 300 quizzes to grade and hours of work. After months of pilots with educators like Dr. Piedra, we launched Quizzes in Google Forms on Monday to help teachers quickly create, deliver and grade assignments or assessments. With Quizzes, teachers can select correct answers for multiple choice and checkbox questions to reduce repetitive grading. They can also enter explanations and review materials to help students learn. And to make sure students understand the lesson material, teachers can prevent students from sending themselves a copy of their responses. Effie Kleinberg of Bnei Akiva Schools in Toronto, likes that Quizzes reduce the overhead of giving formative assessments. “Quizzes make it quick and easy to create and grade a student assessment,” he says. Effie posts his Quizzes as assignments in Google Classroom, where he is easily able to keep track of student responses and view results. Students receive quick, actionable feedback though explanations and review materials, without requiring Effie to manually grade each quiz. 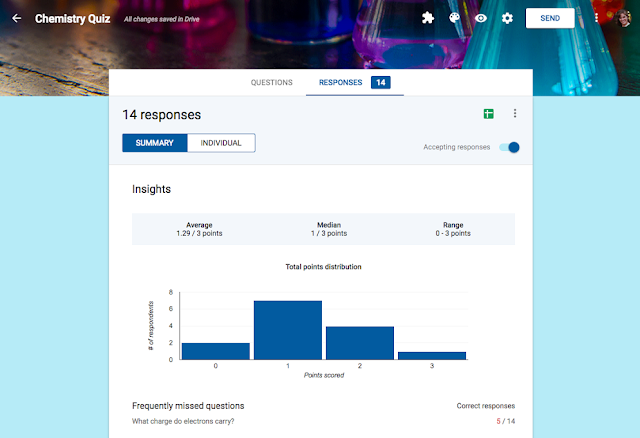 We made Quizzes available to all Google Forms users so we can continue improving based on your feedback. Tasks like automating repetitive grading are just the beginning, so we look forward to hearing what you think. Get started by creating your first Quiz today!